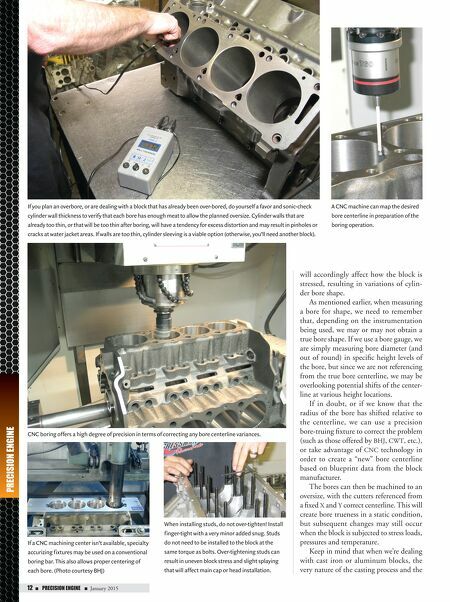 January 2015 n PRECISION ENGINE n 13 material mix can and will create differences from block to block. In other words, if you lined up five blocks with identical casting numbers and identical age, you'd probably find five different variations of bore distortion. Knowing this, we need to temper our view of block analysis. Just because one small-block Chevy of a particular series and casting shows unruly bore distortion in number 3 bore, this does not mean that this condition will be exactly repeated in every block of that vintage and type. Each block casting is its own animal and needs to be treated as such. Primary causes of bore distortion in relation to the cylinder head/block joint include clamping load, cylinder head gas- ket/combustion seal design, the honing procedure and assembly procedures. Clamp Load Clamping load (how the cylinder head is fastened to the block) is a major factor regarding bore distortion. The clamp load must restrain combustion lift-off force and still provide adequate force for the gasket to do its job. Excessive clamp load leads to additional bore distortion. The goal is to minimize clamp load and distribute the clamp load uniformly while maintaining combustion and fluid seals. In addition to the degree of clamping load, the distribution of clamp load affects bore distortion. That's why it's important to follow the correct tightening sequence when installing the heads. While the average engine builder won't have access to sophisticated lab equipment, it's interesting to note that bolt clamp load can be measured by referencing bolt stretch (in terms of length). This is done with a Bidwell Bolt Gauge (formerly known as a Raymond Bolt Gauge), which sends an ultrasonic wave signal through the bolt from the head (or top of the stud). Once this signal travels down to the bottom of the bolt, it then shoots back to the signal sensor. The amount of time that is takes for signal return determines length, or amount of stretch. The bolt is first mea- sured statically to create a reference value, Various Factors Can Affect Cylinder Bore Geometry Changes... Factory original cast blocks: • The density of the material varies • Core thickness varies throughout • Machining tolerances are not within acceptable performance guidelines • Webs or reinforcement of critical areas are not optimal • All core sand, ties, stands and machining debris is not removed • Galleys are not sized or routed optimally • Water jackets and passages do not allow for even heat transfer • Flow problems in molds create weakened areas Aftermarket blocks (all materials): • Some are just copies of OEM and suffer the same ills • Some are far superior in most of the above areas. Torque plates reproduce the stress in the upper 0.5-1.5 inches of the bore that would otherwise be produced by bolting the cylinder head in place while still allowing access to machining the bore. The actual measured amount of distor- tion in the areas around the bolt at the top of the block is seldom more than 0.0005–0.001 inches. This is, however, a significant amount when you consider that the average high- performance engine builder won't accept a bore that is less than 0.0002 inches straight and true. While not considered necessary by some engine builders, it can be beneficial (especially with OE blocks) to torque-plate the block when you bore it if you plan to use torque plates when honing. The hone may jerk from the distortion if it wasn't originally bored with torque plates and sometimes the bore is distorted enough that by the time the machinist straightens the bore, it may be larger than desired. When a block is heated to its intended operating temperature and the sub- sequent related pressure, the amount of distortion will vary depending on many factors. An obvious few are temperature, pressure, block material, varying density of material, quality of casting, Siamese bores, sleeved blocks and offset boring. The average change in size of a cylinder bore heated to 190 degrees from an ambient temperature of 65 degrees is between 0.003–0.004 inches. This antici- pated change is not necessarily linear, as different areas of the cylinder bore may change by varying amounts. In addition to the amount of average bore size increase, the average difference from cylindrical in the heated and pressurized bore seems to be around 0.0015 inches. This change can be several times the change seen with torque plates. which is then compared to stretched length under installed conditions. The final value can be measured in terms of pounds of clamping load. 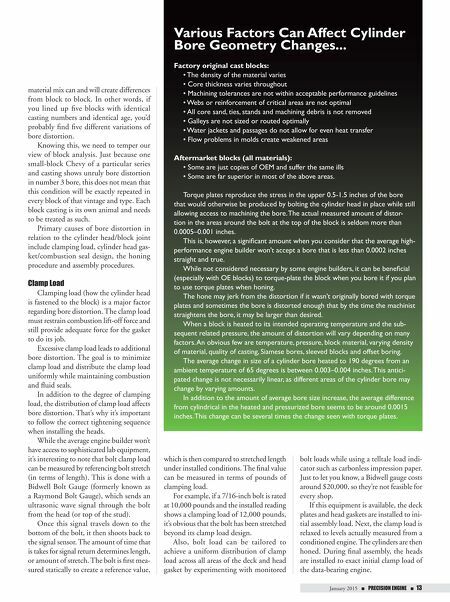 For example, if a 7/16-inch bolt is rated at 10,000 pounds and the installed reading shows a clamping load of 12,000 pounds, it's obvious that the bolt has been stretched beyond its clamp load design. Also, bolt load can be tailored to achieve a uniform distribution of clamp load across all areas of the deck and head gasket by experimenting with monitored bolt loads while using a telltale load indi- cator such as carbonless impression paper. Just to let you know, a Bidwell gauge costs around $20,000, so they're not feasible for every shop. If this equipment is available, the deck plates and head gaskets are installed to ini- tial assembly load. Next, the clamp load is relaxed to levels actually measured from a conditioned engine. The cylinders are then honed. During final assembly, the heads are installed to exact initial clamp load of the data-bearing engine.